After years of decline the popularity of local brandy has stabilised. Ostensibly this is the product of fiscal policy, so to speak, but there’s cause for hope and optimism, and to believe in a real recovery beyond. 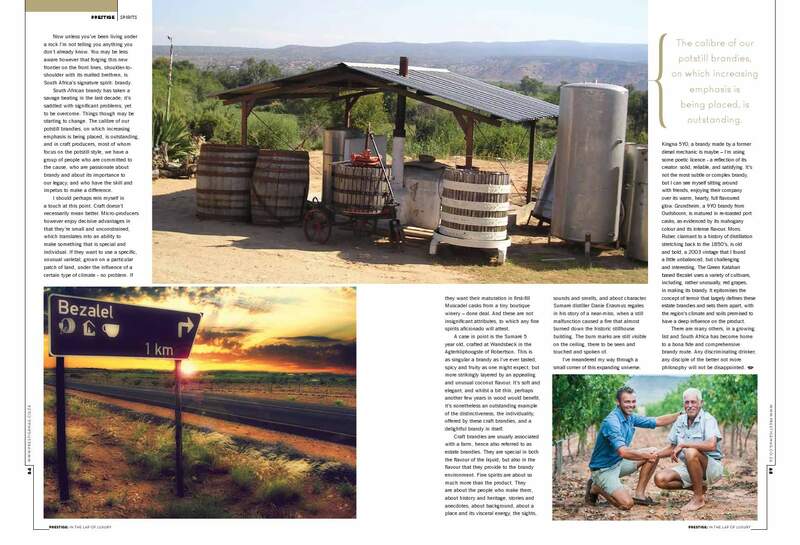 Shepherded by the South African Brandy Foundation, and driven by the contributions of a group of talented producers and an influx of fresh brands, the drink has taken on a new lustre and a renewed purpose. There’s a mountain of good work that has been done, and is ongoing, in three areas in particular, and whilst only time will tell if it will be enough to revisit and exceed past glories, the fruits of this labour, deserving of a (pride of) place in any liquor cabinet, speak for themselves. There must be acute despondency in the other brandy producing regions of the world. Over the last three years, building on an already impressive award-winning track record, South African brandies have made a clean sweep at arguably the world’s two foremost competitions, the International Wine and Spirits Competition and the International Spirits Challenge, taking the best-in-class “Trophy” prizes in each case. This year’s winner at the latter, the KWV 15YO, perfectly epitomises the evolution of local brandy at the upper end of the spectrum. It is rich, oh-so-rich, full-bodied, and complex, with notes of husk fruits, oak and spice, delivering on and exceeding expectations for a fine, luxury spirit. This is a bottle to enjoy at (m)any given moments (not quite any, close though), but pull it out in repose with friends after a fine meal, and you’ll be soon be ascending to an everything-is-right-with-the-world plane of satisfaction. The industry is still young in marketing itself to the world, and in building and justifying stocks of mature enough liquid to go toe-to-toe with the big boys, but the momentum is gathering. It’s just a matter of time. 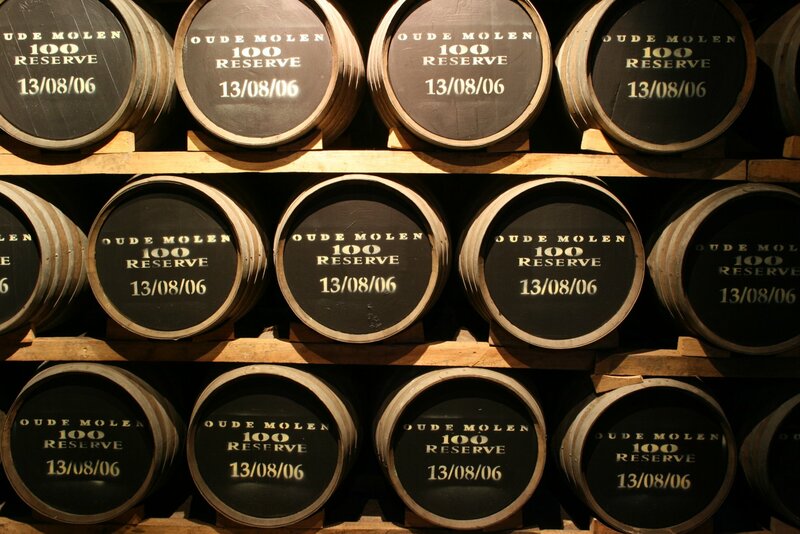 In the interim we local admirers can relish our well-priced access to the world’s most outstanding brandies. There’s one phenomenon that’s convincing me of brandy’s resurgence and of its potential to kick-on more than any other, and that’s the explosive proliferation in the “craft” sector of the industry. There are now dozens of small producers who are putting out audacious, delicious, exceptional offerings, and who are weaving the magic of unique stories to be told, the adventure of new and flavoursome territories to be explored, and the romance of daring exploits to be tasted and experienced, into the tapestry of brandy’s landscape. The lure of its call is being dialled up exponentially. I’ve already mentioned Kingna, made by a diesel-mechanic who discovered a passion and skill for brandy-making and consequently turned distiller, but there are so many others. The coco-nutty Sumasaré 5YO and the fragrant Boplaas 8YO both made immediate, this-is-special impressions on me, and more recently I discovered the Ladysmith 8YO, a journey of garden aromas, with pods of sweet spice, and rakings of orchard fruits and velvet custard scattered on palate and finish. The scene is replete with variety – different music each, but merging into a harmonious concerto. Volumes are small, but that’s not the point. This is the leading edge of the wedge, representing the wider product, and infusing it with an aura of amplified credibility, vigorous energy, and innovative thinking. We have the sweet, exciting privilege of being able to embrace this revolution in its infancy. Long may it last. If you are or were a brandy drinker or had considered giving it a go this is the time to take another look. Things are happening, and they merit your attention. South African brandy has a new mantle, an evolved reputation that’s taken it from being referenced as “karate water” to the elegance of a dedicated drinks trolley, there by request, at the Test Kitchen. It’s not for nothing. This new style has a substance of iron to it. I wouldn’t want to miss out and neither do you. I don’t think that the emphasis on cocktails is the right way to restore faith in South African brandy. They’re easy-come easy-go, not fostering a relationship with the base spirit itself. And if the barmen serving them are clown incompetent and tortoise slow, it doesn’t help. 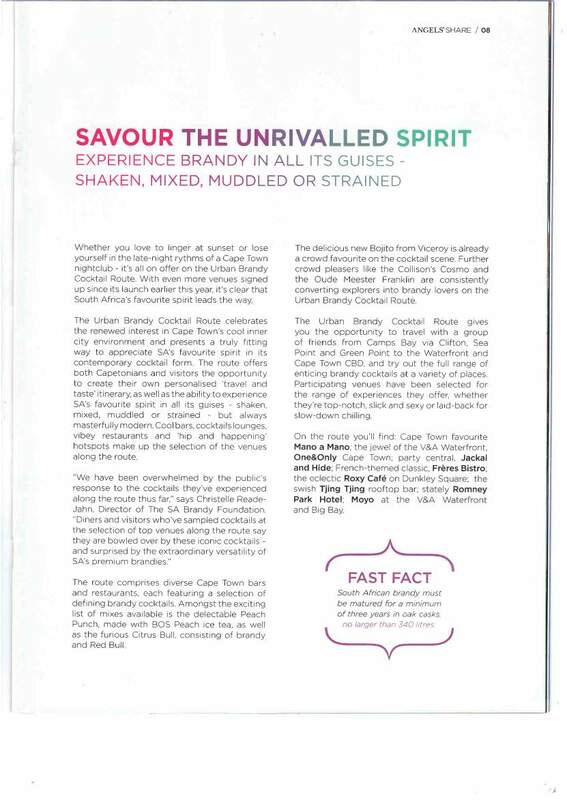 This was the principle drawback – said and out of the way now – to an otherwise outstanding Brandy Festival 2014 (officially Fine Brandy Fusion), held at the Cape Town Convention Centre recently. The most encouraging feature of the Festival was the increasing emphasis on pot still brandy. This stuff is the real deal – made in copper pots, as the name suggests, fully matured, and entirely credible. It is as it should be the flag-bearing style for the industry. Brandy is our signature spirit, a spirit that we can claim to be ours more than any other, and in pot still we have an expression of which we can be truly proud. It became apparent to me as I was touring the exhibitions that there are now four strong mainstream brands each producing a significant range of excellent pot still brandies – not to mention the growing array of boutique creations, which hopefully will be better represented at the Festival in future years. In Van Ryn’s, KWV, Oude Molen and Oude Meester the style is being manifest in a manner befitting its tradition. My introduction to Oude Meester was perhaps was the most encouraging experience of the evening. This was a brandy to which I hadn’t paid much attention in the past. Despite the Jamie Foxx-fronted reinvention it had always struck me as a bit stale and “ou doos”. Anything but! Oude Meester is the sipping brandy for a new generation. The 8YO “Demant” was perhaps the greatest revelation; bold, fresh and flavoursome, it is an easy-drinking and affordable entre to the genre – a welcoming gateway to the world of pot stills. The brand offers a graduated transition to a 12YO and then to its amazing 18YO – also bold and flavoursome, but evolving a generous measure of complexity that was missing in the more obvious Demant. I highly recommend a lingering acquaintance with these brandies, for novices and aficionados alike. Oude Molen, since our last interaction, has doubled the size of its family – the impressive René Single Cask and Solera Grand Reserve joining the legendary VOV and the stalwart 100 Reserve – giving brandy lovers an added variety of terrain for exploration. I believe that their distillery in Elgin is well worth a visit too so that’s something to remember next time you’re in apple country and looking for an agreeable diversion. Whilst I’m more familiar with both Van Ryn’s and KWV, which offer similarly structured portfolios of pot stills each consisting of 10, 12, 15 and 20 YO’s, than any other brandies this was nonetheless a rare opportunity (and privilege) to taste and compare their ranges side by side. The former’s aggressive flavour profiles contrasted with the more subtle, restrained character of the latter, but both are undoubtedly excellent, and deserving of their positions at the head of the pack. The Brandy Festival is still in its infancy, so it may well have escaped your notice – if so then make sure you schedule it in your agenda for next year. It’s a must for anyone with so much as a passing interest. Its purpose is evidently to promote education about and consequently the appreciation of brandy, and in that regard it packs a punch – I particularly liked the nosing beakers isolating some of the more typical brandy flavours – but it does so with a velvet glove: the delicious food (really impressive for this type of large public event), the atmospheric décor, and the supplementary entertainment all contribute to make it a big brandified blast of an evening. I mentioned in an earlier post about pairings that I had recently attended two lunches themed on this format. 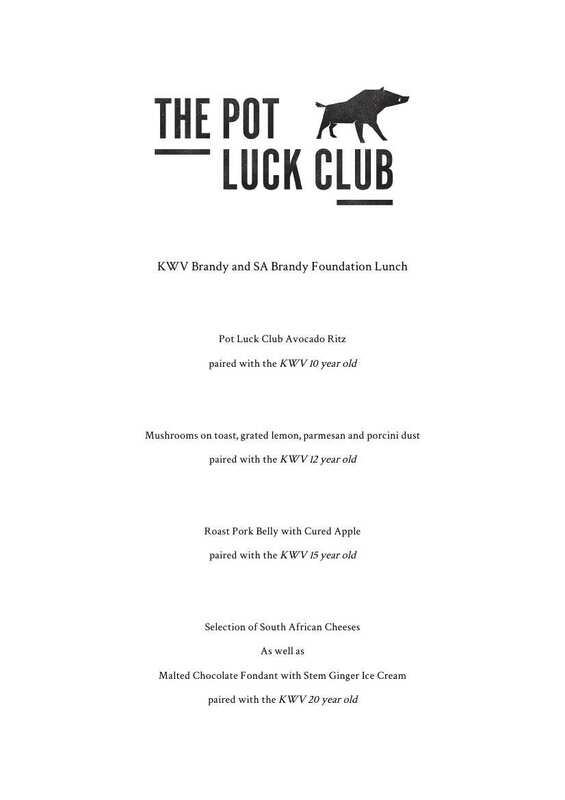 The second of these – hosted at the fabulous Pot Luck Club by the SA Brandy Foundation and KWV – was a showcase for the latter’s core range of premium brandies. I don’t think that they could have chosen a better venue. The spectacular setting – the restaurant is perched at the “top” of Woodstock and enjoys wraparound views – was outdone only by the exquisite meal (and brandies of course), the highlight of which was a world-beating main course of pork belly with cured apple. I’ve heard that this fare has become voguish – fully understandable if the general standard is within shouting distance of the Pot Luck Club’s tour de force. The guys with whom I typically hobnob at most of the liquor events I attend were absent, this being brandy rather than whisky related, so I had the opportunity to make some new acquaintances, including Savile Row and Emily Post aficionado Neil Pendock, whom certain readers may remember fondly – I know I do – from this post, and the affable Alastair Coombe from the blog Brandy and Ginger. The focus during the lunch seemed to be on the new 12YO, which is admittedly very good (a satisfyingly rich brandy, like its 15YO stable-mate), but my attention was drawn to the less fashionable 10YO – for various reasons: it’s a great, flavoursome brandy (I particularly enjoyed the tart apricot on the palate); it’s been selling at a ridiculously good price (good for us, not sure if it’s so good for KWV or for the standing of premium brandies – we’ll just have to trust that they know what they’re doing); and, most compellingly, it’s signalling a promising shift in the industry. I’ve written in the past about how I believe that South African brandy is being hampered by the presence of unmatured wine spirits in its compositions. Well done then to KWV for taking their 10YO and transforming it from vintage to potstill (100% pot distilled, matured brandy). This is the direction in which the industry should be travelling. The descriptor “vintage” however still remains on the bottles (and on the tasting notes provided to us at the lunch!) – I’m told that “they have yet to effect a label change” – which I find puzzling (disquieting? ); these types of changes don’t happen overnight and I would have thought KWV would want to shout this out. Anyhow, stranger things have happened. The selection – delicious throughout – was completed by the 20YO potstill, which I found to have a deep, layered nose that retreated to softer, more restrained flavours on the palate. This KWV ensemble is an engaging, interesting range of potstills that demonstrates the excellence of South African brandy. One day in the not too distant future we’ll be scratching our heads and marvelling at how it could ever have been possible in late 2013 – early 2014 to buy a 10YO and 12YO potstill brandy of such quality for under R200 and R250 respectively (despite having to bear in mind that at 38% ABV versus 43% for most other spirits they should be, simplistically, about 12% cheaper like-for-like). Brandy might have been struggling of late but if producers can invest in the intrinsics and keep offering this calibre of liquid then the tide will surely turn. I’ve previously remarked on the good work being done by the SA Brandy Foundation, the co-hosts and organisers of the lunch – which was another feather in their cap. I may not agree with their emphasis on brandy cocktails (the basis for one of their promotional campaigns), but there’s no arguing with the vigour and dynamism that they’ve injected into the category. I’d left the event impressed – as I’m sure was the intention, job deservedly done – and replete with positive sentiments, so it’s with some reluctance and discomfort (a mental indigestion – ironic because the lunch sank happily into my depths) that I’m now going to raise a few concerns; unfortunately it’s necessary if I’m to be objective and true to my observations. I don’t pretend to be comprehensively aware of all of (or even most of) the Foundation’s activities. I’m sure that there’s a lot of great (and vital) work being done about which I don’t have the slightest inkling – so keep this context in mind. I’ve kept an eye however on its efforts in the area of consumer education, which I had felt to be commendable. It was sad thus to take note of a few (small, but important in my opinion) recent reversals. Firstly I noticed this call-out on page eight of the Summer 2013 edition of the Foundation’s magazine (called Angel’s Share). Now, this is clearly false. When I queried it, rather than retracting or admitting a mistake, I was told by the Foundation’s spokesperson that “Potstill brandy must be aged for a minimum of three years in casks no larger than 340 litres”. Somehow the fact that they hadn’t mentioned the word “potstill” didn’t seem to enter the equation. Misleading? Definitely. Deliberately misleading? I sincerely hope not. I think the latter, if it were the case – apart from being just plain wrong – would also be short-sighted and counter-productive in the long-run: if I was told that a 1.6L car was a 2.5L I’d probably end up being disappointed with its performance. Secondly I also noticed that the Foundation’s explanations of the classes of South African brandy, as stated on its website and in the magazine, had gone from being brilliantly specific (and to my mind very clear and easy-to-understand) a few months ago to vague-ish, lacking transparency, and, in one case – the definition for vintage brandy – a bit confusing. With regards to the latter the magazine suggests that these “contain a minimum of 30% potstilled brandy, blended with matured and unmatured wine spirit” whilst the current version of website defines them as “potstill brandy blended with matured wine spirit” (I’ve since been told that the latter is accurate, following an agreement by the industry, but not yet enacted in law – so much like the improvement to potstill brandy that did away with its unmatured component). Now there’s obviously detail in these definitions that could be perceived as unflattering, however the Foundation’s purported reason for how it now portrays them, i.e. the stripping out of much of this detail (you can see this taking place even in the two excerpts I’ve just provided), was simplicity – to deal with “a crisis regarding consumer confusion and apathy”. I disagree. Surely the best way to tackle confusion and apathy is better not lesser education. 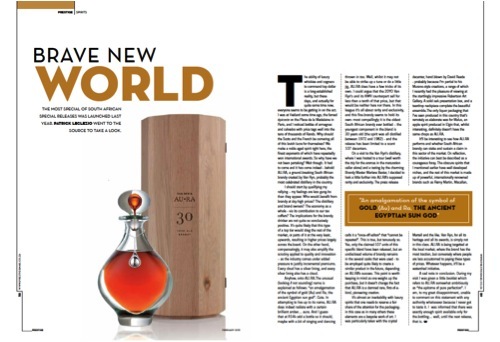 This is easier said than done of course – I realise that I’m shouting from the stands – but if South African brandy has aspirations to be world-class, which I think it rightfully does, then I don’t think there’s any other way. These issues though don’t really matter when you’re sitting with a glass of the good stuff in front of you. My message then to brandy lovers for the new year: ditch your coke and take the step up to potstill, at least partially. On the evidence of this showing, and others, you won’t look back. The most special of South African special releases was launched last year. I went to the source to take a look. First published in Prestige Magazine (February 2013 edition). Amusing signage at the Van Ryn’s distillery. The ability of luxury whiskies and cognacs to command top dollar is a long-established reality, but these days, and actually for quite some time now, everyone seems to be getting in on the act. I was at Hediard some time ago, the famed épicerie on the Place de la Madelaine in Paris, and I noticed bottles of armagnac and calvados with price tags well into the tens of thousands of Rands. Why should the Scots and the French be cornering all of this lavish lucre for themselves? We make a noble aged spirit right here, the finest exponents of which have repeatedly won international awards. So why have we not been partaking? Wait though. It had to come and it has come indeed – behold AU.RA, a ground-breaking South African brandy created by Van Ryn, probably the most celebrated distillery in the country. I should start by qualifying my rallying – my feelings are less gung-ho than they appear. Who would benefit from brandy at sky-high prices? The distillery and brand owners? The economy as a whole – via its contribution to our tax coffers? The implications for the brandy drinker are not quite so conclusively positive. It’s quite likely that this type of a top tier would drag the rest of the market upwards, or parts of it at the very least, resulting in higher prices largely across the board. On the other hand, compensatingly, it may also amplify the scrutiny applied to quality and innovation – as the industry comes under added pressure to justify incremental premiums. Every cloud has a silver lining, and every silver lining also has a cloud. Anyhow, onto AU.RA. The unusual (looking if not sounding) name is explained as follows: “an amalgamation of the symbol of gold (Au) and Ra, the ancient Egyptian sun god”. Cute. In attempting to live up to its name AU.RA does indeed radiate with a certain brilliant amber…aura. And I guess that at R14k odd a bottle so it should, maybe with a bit of singing and dancing thrown in too. Well, whilst it may not be able to strike up a tune or do a little jig, AU.RA does have a few tricks of its own. I could argue that the 20YO Van Ryn’s and its KWV counterpart sell for less than a tenth of that price, but that would be neither here nor there. 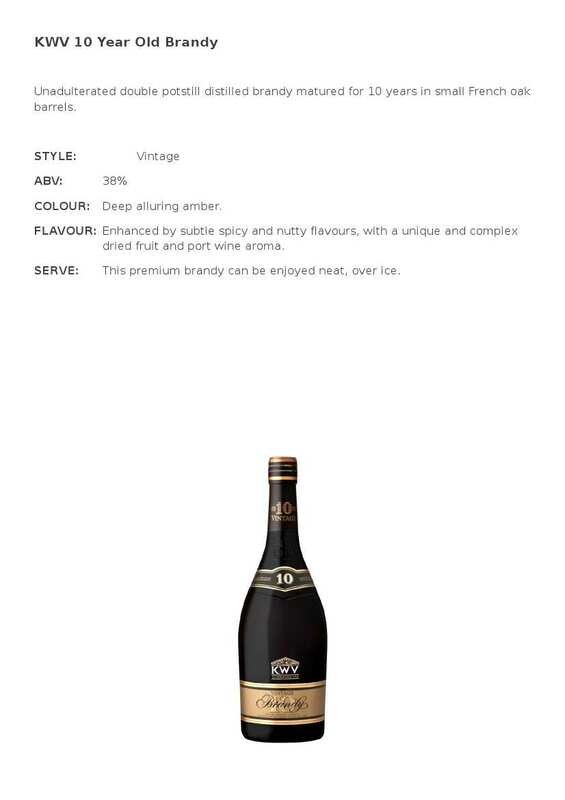 In this league it’s all about rarity and exclusivity, and this fine brandy seems to hold its own: most compellingly it is the oldest South African brandy ever bottled – the youngest component in the blend is 30 years old (the spirit was all distilled between 1972 and 1982) – and the release has been limited to a scant 107 decanters. On a visit to the Van Ryn’s distillery, where I was hosted to a tour (well worth the trip for the aromas in the maturation cellar alone) and a tasting by the charming Brandy Master Marlene Bester, I decided to look a little further into AU.RA’s supposed rarity and exclusivity. The press release calls it a “once-off editon” that “cannot be repeated”. This is true, but tenuously so. Yes, only the claimed 107 units of this specific blend have been released, but an undisclosed volume of brandy remains in the several casks that were used – to be employed quite likely to create a similar product in the future, depending on AU.RA’s success. This point is worth keeping in mind as one weighs up the purchase, but it doesn’t change the fact that AU.RA is a damned rare, first-of-a-kind, pioneering creation. It’s almost an inevitability with luxury spirits that one needs to reserve a fair share of the attention for the packaging; in this case as in many others these elements are a bespoke work of art. I was particularly taken with the crystal decanter, hand blown by David Reade – probably because I’m partial to his Murano-style creations, a range of which I recently had the pleasure of viewing at the startlingly impressive Robertson Art Gallery. A solid oak presentation box, and a teardrop neckpiece complete the beautiful ensemble. The only liquor packaging that I’ve seen produced in this country that’s remotely as elaborate was for Malus, an apple spirit produced in Elgin that whilst interesting definitely doesn’t have the same chops as AU.RA. It’ll be interesting to see how AU.RA performs and whether South African brandy can stake and sustain a claim in this sector of the market. On reflection the initiative can best be described as a courageous foray. The obscure spirits that I mentioned earlier have well developed niches, and the rest of this market is made up of powerful, internationally renowned brands such as Remy Martin, Macallan, Martell and the like. Van Ryn for all its heritage and all its awards is simply not in this class. AU.RA is being targetted at the local market, where the brand has the most traction, but conversely where people are less accustomed at paying these types of prices. Whatever happens it’ll be a watershed initiative. A sad note in conclusion. During my visit I was given a little booklet which refers to AU.RA somewhat ambitiously as “the epitome of pure perfection”. I am, to my great disappointment, unable to comment on this statement with any authority whatsoever because I never got to taste it. I was informed that there was exactly enough spirit available only for the bottling. Hmm…until the next release that is. First published in Prestige Magazine (April 2012 edition). 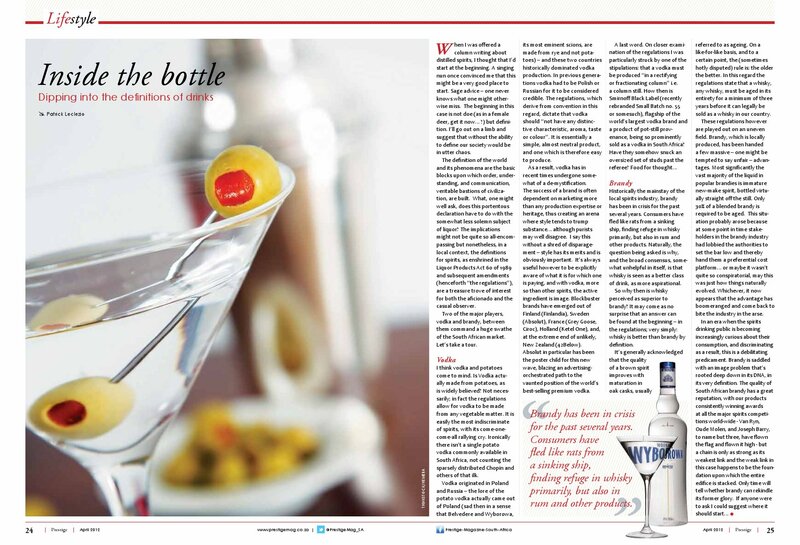 An aside: The guys at Prestige Magazine have asked me to write a second column, on spirits in general, and this is the first attempt. This column will feature whisky on the rare occasion, but it will be more focused on other spirits so that they too get some coverage. When I was offered a column writing about distilled spirits, I thought that I’d start at the beginning. A singing nun once convinced me that this might be a very good place to start. Sage advice – one never knows what one might otherwise miss. The beginning in this case is not doe (as in a female deer, get it now…?) but definition. I’ll go out on a limb and suggest that without the ability to define our society would be in utter chaos. The definition of the world and its phenomena are the basic blocks upon which order, understanding, and communication, veritable bastions of civilization, are built. 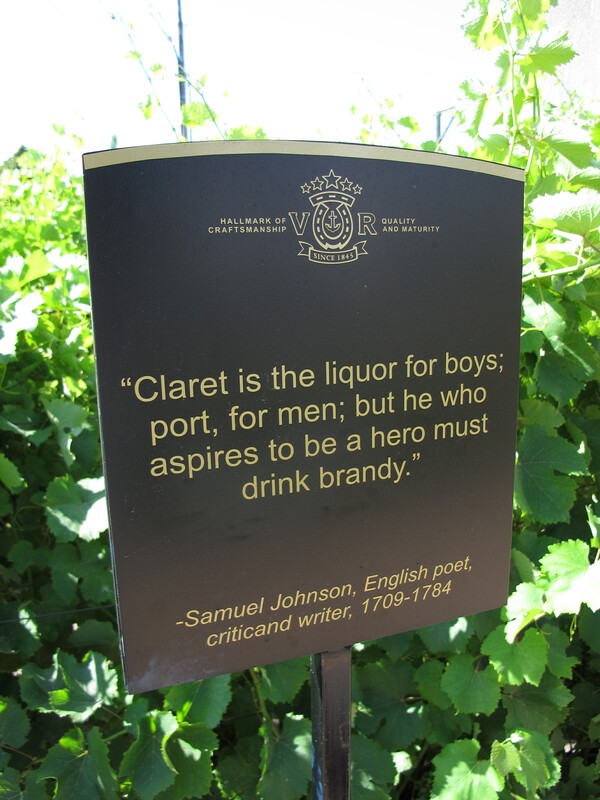 What, one might well ask, does this portentous declaration have to do with the somewhat less solemn subject of liquor? The implications might not be quite so all-encompassing but nonetheless, in a local context, the definitions for spirits, as enshrined in the Liquor Products Act 60 of 1989 and subsequent amendments (henceforth “the regulations”), are a treasure trove of interest for both the aficionado and the casual observer. Two of the major players, vodka and brandy, between them command a huge swathe of the South African market. Let’s take a tour. I think vodka and potatoes come to mind. Is Vodka actually made from potatoes, as is widely believed? Not necessarily; in fact the regulations allow for vodka to be made from any vegetable matter. It is easily the most indiscriminate of spirits, with its come-one-come-all rallying cry. Ironically there isn’t a single potato vodka commonly available in South Africa, not counting the sparsely distributed Chopin and others of that ilk. Vodka originated in Poland and Russia – the lore of the potato vodka actually came out of Poland (sad then in a sense that Belvedere and Wyborowa, its most eminent scions, are made from rye and not potatoes) – and these two countries historically dominated vodka production. In previous generations vodka had to be Polish or Russian for it to be considered credible. The regulations, which derive from convention in this regard, dictate that vodka should “not have any distinctive characteristic, aroma, taste or colour”. It is essentially a simple, almost neutral product, and one which is therefore easy to produce. As a result, vodka has in recent times undergone somewhat of a de-mystification. The success of a brand is often dependent on marketing more than any production expertise or heritage, thus creating an arena where style tends to trump substance…although purists may well disagree. I say this without a shred of disparagement – style has its merits and is obviously important. It’s always useful however to be explicitly aware of what it is for which one is paying, and with vodka, more so than other spirits, the active ingredient is image. Blockbuster brands have emerged out of Finland (Finlandia), Sweden (Absolut), France (Grey Goose, Ciroc), Holland (Ketel One), and, at the extreme end of unlikely, New Zealand (42Below). Absolut in particular has been the poster child for this new wave, blazing an advertising-orchestrated path to the vaunted position of world’s best-selling premium vodka. 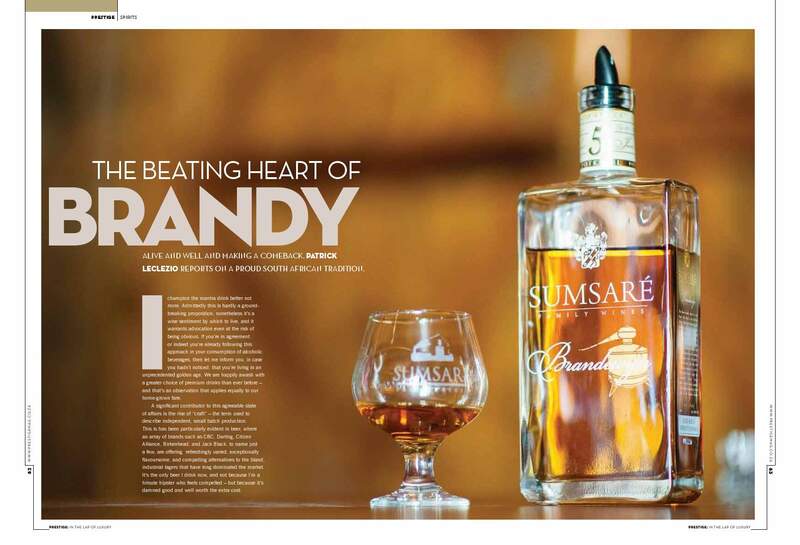 Historically the mainstay of the local spirits industry, brandy has been in crisis for the past several years. Consumers have fled like rats from a sinking ship, finding refuge in whisky primarily, but also in rum and other products. Naturally, the question being asked is why, and the broad consensus, somewhat unhelpful in itself, is that whisky is seen as a better class of drink, as more aspirational. So why then is whisky perceived as superior to brandy? It may come as no surprise that an answer can to be found at the beginning – in the regulations; very simply: whisky is better than brandy by definition. It’s generally acknowledged that the quality of a brown spirit improves with maturation in oak casks, usually referred to as ageing. On a like-for-like basis, and to a certain point, the (sometimes hotly disputed) rule is: the older the better. In this regard the regulations state that a whisky, any whisky, must be aged in its entirety for a minimum of three years before it can legally be sold as a whisky in our country. These regulations however are played out on an uneven field. Brandy, which is locally produced, has been handed a few massive – one might be tempted to say unfair – advantages. Most significantly the vast majority of the liquid in popular brandies is immature new-make spirit, bottled virtually straight off the still. Only 30% of a blended brandy is required to be aged. This situation probably arose because at some point in time stakeholders in the brandy industry had lobbied the authorities to set the bar low and thereby hand them a preferential cost platform…or maybe it wasn’t quite so conspiratorial, may this was just how things naturally evolved. Whichever, it now appears that the advantage has boomeranged and come back to bite the industry in the arse.